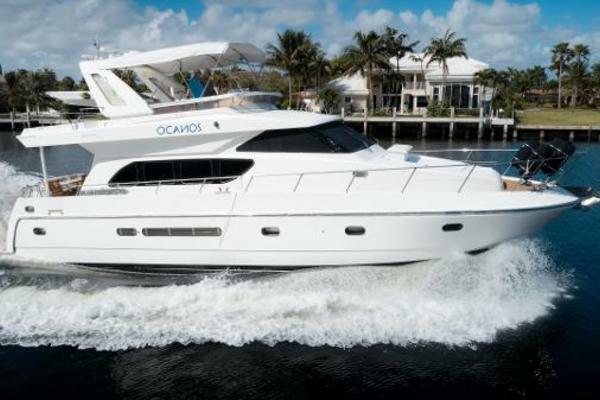 BRIGHT STAR is a 2004 model 59 Marquis fully equipped and maintained to the highest standards by her knowledgeable owner. She has been a freshwater yacht with inside winter storage since new. Call today for all the details. The spacious cockpit has a floor hatch provides easy access to the engine room via a large lazarette. The stainless steel work here and elsewhere is exemplary. Foredeck access from here is via 1 1/2-foot-wide side decks with waist-high bulwarks and ample grabrails. To make your way aft, step through the starboard transom gate down to an enormous swim platform—actually two platforms. There’s a fixed one 40 inches deep followed by a 43-inch-deep one that raises and lowers electrically. Access the flybridge via a comfortable enclosed cockpit stair. The helm station up here is largeand well-laid-out with good sightlines forward. There’s also lots of seating and entertaining space. Access to the salon from the cockpit/aft deck is via the curved stainless steel sliding doors with curved screen door, too. The salon has seven-foot headroom and is surrounded by glass on three sides. 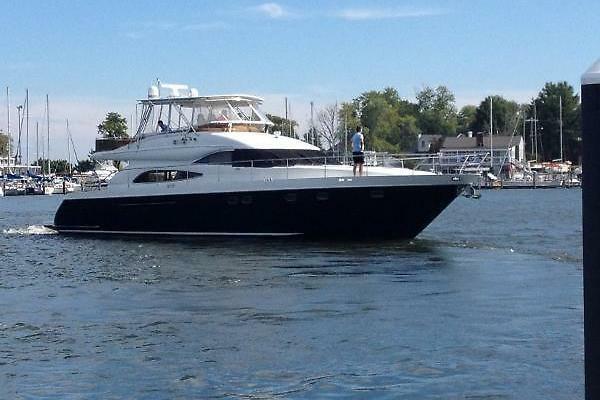 There are straight settees to both port and starboard, a barrel chair aft port, and 110V Surround Sound Stereo System. 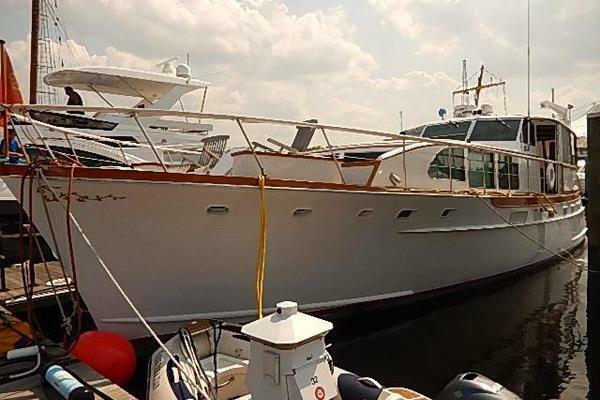 Up three steps from the salon is the large U-shape galley is aft and to starboard on the main level, and as with the heads, its counters and sole are granite. A two-burner ceramic cooktop, stainless steel KitchenAid convection/microwave oven, and below-counter Sub-Zero refrigerator and freezer are standard. An optional Fisher and Paykel drawer-style dishwasher fits under a seat just forward of the galley. There is an optional Cuisinart coffee maker that slides out from its appointed cubby electrically. The optional lower helm station is to port with a nice-size semicircular couch to starboard. Access the lower accommodations down a comfortable 2’5”-wide curved stairway that leads to a large foyer with a granite sole that has LEDs embedded in it. The VIP Stateroom is forward with port and starboard full-length hanging closets, 6’6” headroom, port and starboard ports, and a large en suite head with enclosed shower to starboard. The midship master stateroom offers two larger hanging closets, each with elegantly curved doors, plus two ports and large built-in cabinets on each side. The en suite head has a large enclosed shower. Guest stateroom is midway between the master and VIP staterooms and to port, accessed by a custom designed bi-fold door with bunks and a storage closet. Mariner Italian Faucetry plumbing fixtures, brushed-aluminum Olivari door hardware, exquisite high-gloss varnished cherry wood throughout and superb space utilization gives this Marquis 59 an elegant finish.